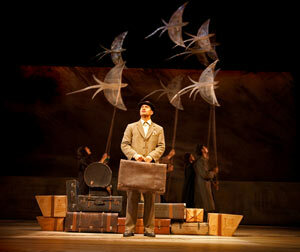 Author/Illustrator Matthew Holm: Shaun Tan's "The Arrival" ... on stage! Every once in a while you see a show that is such a breath of fresh air that you feel aglow when you walk out of the theatre: The Arrival is that kind of show. Although perhaps technically children’s theatre, based as it is on a children’s graphic novel by Shaun Tan, it is perhaps one of the best examples of truly universal theatre that I’ve seen in recent memory. This is a piece of dramatic art that can appeal to anyone and everyone, from the very young to the very old, and better still, language is no barrier. It would be inaccurate to describe the production as entirely non-verbal as it contains a fair amount of voice work, yet it features virtually zero intelligible dialogue, and the majority of the storytelling is achieved through visuals and music. It is hard to adequately describe how this show is actually realised without reading off a laundry-list of the many and varied theatrical techniques employed by these versatile performers, such as mime, puppetry, shadowplay, acrobatics, and many forms of abstracted movement. I think this would have to be the greatest traveling show ever. Instantly performable in any country. No language barriers. I hope hope hope it makes its way to this side of the Pacific.